With an additional weight added to the inside of a standard valve cap, this option offers greater stability to the “center” of the note. It can also add depth to the tone of certain models. The XL bottom caps are double the weight and length of the standard heavy weight caps. This adjustable Tuning Bell Brace can be used with our Custom Built “Tuning Bell” (L) model Bb and C trumpets. The brace clamps to the ferrule of the mouthpipe and has a contoured plate that adjusts to the shape of the bell. A longer mouthpipe offered only in the key of ‘A’ for piccolo trumpets. Available with either a cornet or trumpet mouthpiece receiver. Please specify when ordering. An industry standard for over 50 years, Schilke Slide Grease is specifically formulated at the Schilke factory. It is a critical component in maintaining slide assemblies. Schilke valves are fit at the tight tolerances and have set a standard within the industry for precision. Keeping the valves properly lubricated is essential for optimum performance. 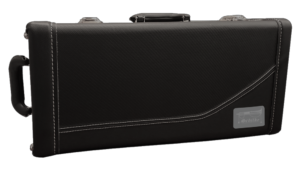 Designed for Bb or C trumpets, our streamlined single case option features a semi-rigid design, external accessory pocket, side handle and black exterior with Schilke logo. It stores a single trumpet vertically. This case offer superior fit with very little movement from front to back or side to side. This case will also fit most cornets. There are three double case designs. The first is our standard double case. 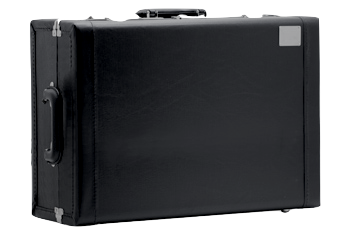 This case features two slots to store trumpets vertically with a traditional wood shell design, reinforced lid, black exterior with black-on-black leather trim, heavy hardware and Schilke nameplate. This case will fit Bb & C Trumpets, E3L Eb/D Trumpets, G1L G/F Trumpets and P5-4 Bb/A Piccolo Trumpets. The second case features the same exterior as the first case, but the interior features include a removable blocking system that allows the player to adjust the inside of the case to properly fit any Schilke trumpet. This case is ideal for the E3L-4 Eb Trumpet with long 4th slide. The third double case is designed for the Soloiste Series Bb & C Trumpets. The interior is similar to the first case, but features a two-tone exterior color scheme. This case features four slots to store instruments vertically with a traditional wood shell design, reinforced lid, black exterior with leather trim, heavy hardware and Schilke nameplate. The interior features include a removable blocking system that allows the player to adjust the inside of the case to properly fit any Schilke instrument. 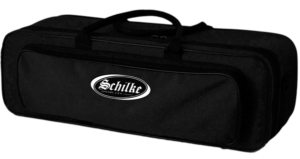 This case may be used as a trumpet quad case or a flugelhorn/trumpet combo case by removing insert dividers and easily inserting a flugelhorn tray created to accommodate a Schilke flugelhorn. 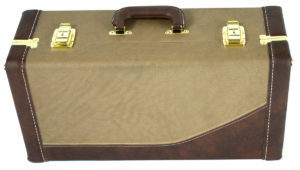 This half size single case is designed to store a P7-4 Piccolo Trumpet, G1L-4 G Trumpet or Cornet only. It features a rear vertical slot for the instrument with additional front space for mutes or accessories. Within our tradition, this wood shell case offers a reinforced lid, black exterior with leather trim, heavy hardware, front & side handles and Schilke nameplate. The interior features include a removable block that allows the player to adjust the inside of the slot to properly fit their instrument. Ideal for storage or that situation when you only need to carry a piccolo, G trumpet or cornet.